Are your kids tired of skating Carlsbad’s newest skateboard park at Alga Norte? This mini-session from pro skateboarder Chris Cole should give them a few ideas on some new lines to take. Pretty smooth, huh? He makes this skatepark look even better than it is and gives away a couple pairs of Thunder Trucks in the process. The City of Carlsbad’s amazing new Alga Norte Community Park is hosting its grand opening on Saturday, January 11, 2014. The celebration kicks off at 10 AM in the aquatic center. The park will then be open to the public with open play in the swimming pools, a dive show, Skateboarding demonstrations, park turns, and a youth basketball scrimmage with guest announcer and NBA legend Bill Walton. The Alga Norte Community Park is located at 6565 Alicante Road in Carlsbad, California. For more information please click the link. Carlsbad’s last public skateboard park had some issues from the very beginning. While fun to roll, it never has had much flow and some of the sections were just plain wrong. Thankfully, that won’t be the case with the new Alga Norte Skatepark thanks to the involvement of former pro skateboarder Kanten Russell, according to a story in the U-T San Deigo. We can’t wait. . . The City of Carlsbad Parks and Recreation Department wants your kids (ages 5 to 13) to go skateboarding (or just get out of your hair) during Spring Break 2013. And to do that they’re offering the Spring Break Go Skate: Skateboarding Camp. Go Skate Skateboarding School puts the beginner and intermediate rider on the fast track to being a confident skateboarder. Our mission is to help spread the love of skateboarding across all levels. What a skater will learn: proper foot placement, how to balance, how to use the board for transportation, basic tricks, proper skate park etiquette and terms, as well as safety. Bring your own board, elbow/knee pads, wrist guards, and helmet. All equipment must be worn in order to be in the camp. The US Bank on Carlsbad Village Drive near Jefferson was robbed yesterday (October 16, 2012) by a man on a skateboard, according to a story in the North County Times. The robber told the bank teller he had a gun, although no one saw the weapon during the robbery, which happened about 2:30 p.m. at the U.S. Bank on Carlsbad Village Drive near Jefferson Street, Sgt. Greg White said. . . The robber was gone when police arrived. As numerous commenter have pointed out: is it really that easy to rob a bank? Guess so. 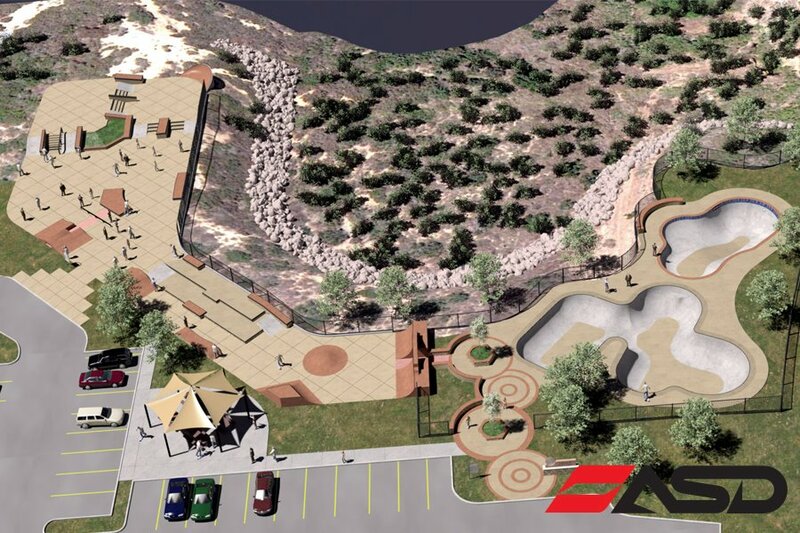 According to Carlsbadistan based Action Sport Design, Carlsbad’s upcoming Alga Norte Skatepark will look a lot like this. The new City of Carlsbad, CA Skate Park is ready for 2012 ! ASD was selected to completely re-design the park before construction. Thanks for all the input from Pro Skater Andy Mac on the bowls and the entire ASD team for their hard work. This skateboard park has been in the planning stages so long that it’s good that it gets a little update. And it looks good. The bowls look fun and the street section looks like the latest in skate plaza goodness. This should be good. The City of Carlsbad is currently seeking bids from pre-qualified construction companies and construction of the park project could start “before summer.” The sooner the better. For the past few months, on days when it was too rainy for City of Carlsbad maintenance workers to do their real jobs, employees were sent out to the Carlsbadistan seawall suited in rain gear and armed with cordless drills and glue guns. Their mission: to install skate stopper devices on every handrail, on every set of stairs on the seawall from Pine Ave. to Tamarack. Sounds like a great idea, right? While the stoppers may deter skateboarders (and inline skaters) from grinding the handrails, they will certainly not keep them from jumping over the rails as skateboarder Kenny Hoyle did recently on the January cover of Transworld Skateboarding magazine. Gravity Skateboard’s Sara Locke talks skateboarding and surfing in Carlsbadistan. Last week the Carlsbad City Council updated City code regarding “inline and roller skaters” allowing them to basically roll anywhere they want on the upper sea wall and in the Village. Sadly, the new updates did nothing to correct the City’s insanely draconian rules regarding skateboarding. Inline and roller skaters are free to cruise the upper seawall in Carlsbad, as long as they use caution, according to updated rules introduced Tuesday to the City Council. The lower seawall will remain a pedestrian only zone, with no wheeled forms of transportation allowed. . . . The rule changes also allow inline and roller skaters in the Village area. 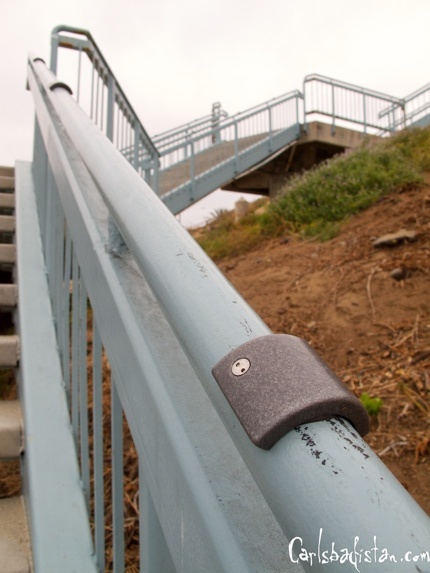 Skateboards will continue to be banned from the upper and lower seawall, the walkway on Carlsbad Boulevard between Tamarack Avenue and Cannon Road, the Village area and other commercial zones where signs are posted.